Everything you have heard about evolution is a lie!!! in a new book, which I admit I haven’t read, but I did get a good chuckle out of the synopsis, Dr. Aaron G. Filler is going to set the record straight. For all of you who chucked your bible in the garbage because you believed that you descended from Apes, prepare for the shock of it all: you believed a lie! There is now COMPELLING EVIDENCE, even more compelling that the indisputable evidence we had before, but threw away so we could sell more books, compelling evidence that things happened the other way around. 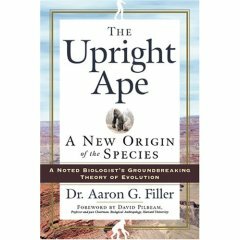 APES ACTUALLY DESCENDED FROM US! This explains a lot, especially if you watch wrestling on TV. I agree with Malcom Muggeridge who said that in the future a retrospecitve glance at evolution will view the whole thing as one of the great jokes of history.